At The Eye Doctors, Dr. Larry Vander Zee, Dr. Paul Greenfield, Dr. Jeannie Dehne and our entire team are committed to providing excellent vision care in a professional and comfortable environment. As an optometry clinic in Sioux Falls, our primary eye care services include a routine eye exam that analyzes eye health and vision function, often times resulting in a corrective prescription. In addition to eye exams and vision testing, our doctors are fully licensed and equipped to provide testing for a complete range of medical reasons, including glaucoma, cataracts, macular degeneration and diabetic retinopathy. If your condition requires specialized treatment you can rest assured that we will refer you to one of the skilled ophthalmologists with whom we partner. Our doctors and the The Eye Doctors team take both routine and comprehensive eye exams very seriously. 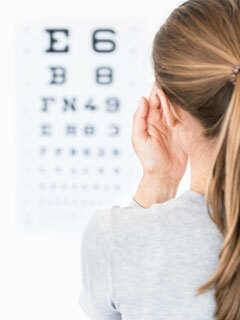 During a 6 month, yearly or bi-yearly examination, every patient will receive a patient history review, a series of vision and eye tests, assessments of eye focusing and movement, and an eye health evaluation. Call us a today at (605) 338-7104 to schedule an appointment.